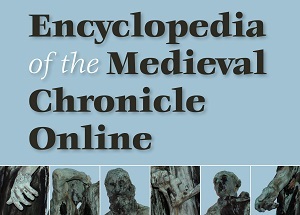 The Encyclopedia of the Medieval Chronicle brings together the latest research in chronicle studies from a variety of disciplines and scholarly traditions. Chronicles are the history books written and read in educated circles throughout Europe and the Middle East in the Middle Ages. For the modern reader, they are important as sources for the history they tell, but equally they open windows on the preoccupations and self-perceptions of those who tell it. Interest in chronicles has grown steadily in recent decades, and the foundation of a Medieval Chronicle Society in 1999 is indicative of this. Indeed, in many ways the Encyclopedia has been inspired by the emergence of this Society as a focus of the interdisciplinary chronicle community. The online version was updated in 2014 and in 2016. János Bak, The Medieval Review, August 2010. Tilman Spreckelsen, Frankfürter Allgemeine Sonntagszeitung, 3 August 2011 [in German]. Johannes Bernwieser, IASL-Online, 2012 [in German]. Rosalind Brown-Grant, Modern Language Review 107 (2012), 1226-28. Claire de Cazanove, Francia-Recensio, 2012 [in French]. Andrei Timotin, Revue des Etudes Sud-Est Européennes / Journal of South-East European Studies, 50 (2012), 365-366 [in French]. Bernd Schütte, H-Soz-u-Kult, 2012 [in German]. Gerhard Wolf, Das Mittelalter, 17 (2012), 153-154 [in German]. Roman Deutinger, Historische Zeitschrift, 296 (2013), 174-175 [in German]. Mischa Meier, sehepunkte, 13 (2013), Nr. 6 [in German].